Today at Photokina 2012, Canon added two new high-end compact cameras with manual control and raw image capture to its lineup. The Canon PowerShot G15 boasts an extra-wide aperture, while the Canon PowerShot SX50 HS sports an impressive 50x optical zoom. The Canon G15 features a new, brighter f/1.8-2.8 lens with 5x zoom, providing an extra-wide aperture throughout the camera's entire focal range. Canon says the Canon SX50 HS is the first 50x optical zoom stills camera in the world. Both cameras have new lenses. The Canon PowerShot G15 features an extra bright f/1.8-2.8 lens, with new highly refractive glass with a multiple material coating that handles specific light wavelengths at the nanometre scale. Its 5x optical zoom offers an f/1.8 aperture at its 28mm wide-angle, and an f/2.8 aperture at its maximum 140mm focal length. The Canon PowerShot SX50 HS uses 13 elements, with three UD lenses in a 10 group optical arrangement. New Ultrasonic Motor (USM) and Voice Coil Motor (VCM) systems ensure fast and "near-silent" zooming when zooming from the 24mm wide angle through to 1,200mm maximum reach. ZoomPlus increases the reach to a 100x digital zoom. The cameras both offer full manual control over aperture, shutter speed, white balance and ISO sensitivity, and raw image capture. Both compacts feature high-speed Burst HQ mode for shooting fast moving subjects, Smart Auto, Face ID and Multi-Area White Balance modes, and the Canon SX50 HS boasts Seek and Lock functions. Both PowerShot cameras feature Canon's HS system and optical Image Stabilizer with Intelligent IS, to 4-stops on the G15 and 4.5-stops on the SX50 HS. A new Dynamic IS mode in the SX50 HS reduces camera shake in handheld video recording. 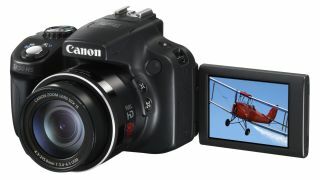 The Canon PowerShot G15 features a new 1/1.7 high-sensitivity CMOS sensor and sensitivity settings up to ISO 12,800. DIGIC 5 processing in each model handles noise in a variety of lighting scenarios. Canon says the PowerShot G15's AF focuses in 0.17 seconds at the wide-angle, which is 53% faster than the PowerShot G12, making it Canon's fastest compact yet. Both cameras also support 1080p Full HD movie recording at 24fps, with stereo sound. Optical zooms and AF can be used during video capture. Both PowerShots have a hotshoe to attach Canon flash accessories, and lens filter adaptors can fit Canon's EOS filters. Both models are compatible with the remote switch RS-60E3, and a waterproof case WP-DC48 is also available for the PowerShot G15. The Canon PowerShot SX50 HS is priced at £449.99/$479.99, while the Canon PowerShot G15 costs £549.99/$499.99. Both cameras will be available in late October.